Gut microbiota contribute to the health of their hosts, and alterations in the composition of this microbiota can lead to disease. Previously, we demonstrated that indigenous gut bacteria were required for the insecticidal toxin of Bacillus thuringiensis to kill the gypsy moth, Lymantria dispar. B. thuringiensis and its associated insecticidal toxins are commonly used for the control of lepidopteran pests. A variety of factors associated with the insect host, B. thuringiensis strain, and environment affect the wide range of susceptibilities among Lepidoptera, but the interaction of gut bacteria with these factors is not understood. To assess the contribution of gut bacteria to B. thuringiensis susceptibility across a range of Lepidoptera we examined larval mortality of six species in the presence and absence of their indigenous gut bacteria. We then assessed the effect of feeding an enteric bacterium isolated from L. dispar on larval mortality following ingestion of B. thuringiensis toxin. Oral administration of antibiotics reduced larval mortality due to B. thuringiensis in five of six species tested. These included Vanessa cardui (L.), Manduca sexta (L.), Pieris rapae (L.) and Heliothis virescens (F.) treated with a formulation composed of B. thuringiensis cells and toxins (DiPel), and Lymantria dispar (L.) treated with a cell-free formulation of B. thuringiensis toxin (MVPII). Antibiotics eliminated populations of gut bacteria below detectable levels in each of the insects, with the exception of H. virescens, which did not have detectable gut bacteria prior to treatment. Oral administration of the Gram-negative Enterobacter sp. NAB3, an indigenous gut resident of L. dispar, restored larval mortality in all four of the species in which antibiotics both reduced susceptibility to B. thuringiensis and eliminated gut bacteria, but not in H. virescens. In contrast, ingestion of B. thuringiensis toxin (MVPII) following antibiotic treatment significantly increased mortality of Pectinophora gossypiella (Saunders), which was also the only species with detectable gut bacteria that lacked a Gram-negative component. Further, mortality of P. gossypiella larvae reared on diet amended with B. thuringiensis toxin and Enterobacter sp. NAB3 was generally faster than with B. thuringiensis toxin alone. This study demonstrates that in some larval species, indigenous gut bacteria contribute to B. thuringiensis susceptibility. Moreover, the contribution of enteric bacteria to host mortality suggests that perturbations caused by toxin feeding induce otherwise benign gut bacteria to exert pathogenic effects. The interaction between B. thuringiensis and the gut microbiota of Lepidoptera may provide a useful model with which to identify the factors involved in such transitions. Since the independent discovery of Bacillus thuringiensis in two lepidopteran species, Bombyx mori (L.) and Ephestia kuehniella (Zeller), at the beginning of the 20th century [1, 2], Lepidoptera have served as the leading insect model for elucidating the mode of action and specificity of B. thuringiensis and its associated insecticidal toxins. A variety of lepidopteran whole-animal models, as well as cell lines and membrane preparations derived from Lepidoptera, have been used to identify factors that enhance or inhibit B. thuringiensis activity and define the cellular and molecular responses to B. thuringiensis toxin. In particular, the use of lepidopteran cell culture and brush border membrane vesicle preparations to dissect the complex interactions between toxin and midgut receptors have generated a substantive understanding of the mechanisms of pore formation and defined the processes that lead to disruption of larval gut integrity [3–5]. In combination with studies on resistant insects, studies in these models have also identified the specific midgut receptors involved in toxin binding, including cadherin-like proteins, aminopeptidases, and additional GPI-anchored proteins such as alkaline phosphatase [6–11]. These studies have also demonstrated that susceptibility to B. thuringiensis varies among different species of Lepidoptera, in the amount of toxin required to cause mortality, the speed of mortality, and the response to toxin following ingestion [12, 13]. Beginning with their original characterization, Heimpel and Angus described B. thuringiensis as exhibiting variable modes of action, and thus categorized lepidopteran host species into three groups . Type I species exhibit a general paralysis following ingestion of toxin and rapid death within hours. Type II species, which include the majority of Lepidoptera, are characterized by a cessation of feeding following toxin ingestion, a paralysis restricted to the gut, and death within 2 to 4 days. Type III insects require both spore and toxin for mortality by B. thuringiensis. Subsequent analyses demonstrated additional complexity in host responses, as factors such as toxin concentration and larval age can result in variable modes of action even within the same insect species (for example, toxic action at high doses, septicemia at low doses) [15–17]. In addition, certain physiological and genetic features of lepidopteran hosts are known to contribute to differences in susceptibility to B. thuringiensis. For example, host factors such as midgut pH and proteases contribute to the solubilization and activation of toxin following ingestion. The beneficial contributions of gut microbiota to host health are generally acknowledged [18–21]. However, they can also have negative impacts, as perturbations in the composition or location of gut microbiota can lead to pathological states and host mortality [22–26]. Previously, we demonstrated that the elimination of indigenous enteric bacteria from gypsy moth larvae, Lymantria dispar (L.), achieved by rearing them on antibiotics, greatly reduced susceptibility to a formulation of B. thuringiensis (DiPel) composed of cells, spores, and toxins (Cry1Aa, Cry1Ab, Cry1Ac, and Cry2A) . Additionally, re-establishment of a single enteric species, Enterobacter sp. NAB3, restored B. thuringiensis susceptibility. To account for a potential direct impact of antibiotics on the B. thuringiensis bacterium, we used an Escherichia coli strain engineered to produce the B. thuringiensis Cry1Aa toxin gene. Ingestion of an overnight culture containing live, but not heat-killed, E. coli Cry1Aa-producing cells also restored susceptibility of larvae reared on antibiotics to B. thuringiensis. Additionally, prior rearing on antibiotics did not inhibit establishment of Enterobacter sp. NAB3 when fed to larvae after cessation of antibiotic feeding, even though this strain is sensitive to the antibiotics incorporated into artificial diet , suggesting that direct effects of antibiotics on B. thuringiensis cells during the feedback are also unlikely. This interpretation is supported by our direct measurements (not reported) of an average of 2 × 102 CFU/gut of B. thuringiensis from larvae fed antibiotics, compared with 1.6 × 102 CFU/gut in larvae reared without antibiotics. Based on this evidence and our distinction between how B. thuringiensis was unable to grow in the hemolymph of living larvae even though it can grow rapidly in dead or moribund larvae [12, 27, 29–35], we proposed a model in which toxin disruption of the midgut leads to septicemia by enteric bacteria resulting in both larval death and more favorable conditions for B. thuringiensis germination and growth. The broader applicability of this model to additional lepidopteran species was unknown. To determine whether enteric bacteria were necessary for susceptibility to B. thuringiensis in other Lepidoptera, we compared larval mortality to B. thuringiensis in the presence and absence of their indigenous gut bacteria among a range of species from five additional families. These included: Manduca sexta (L.) (Sphingidae), Vanessa cardui (L.) (Nymphalidae), Pieris rapae (L.) (Pieridae), Heliothis virescens (F.) (Noctuidae), and Pectinophora gossypiella (Saunders) (Gelechiidae). We also used a cell-free formulation of B. thuringiensis, MVPII, in assays with L. dispar to extend our work with the DiPel cell-based formulation. The MVPII formulation consists of Cry1Ac protoxin encapsulated in NaCl-killed Pseudomonas fluorescens cells. MVPII was also used in assays with Pectinophora gossypiella, as it is the most commonly used B. thuringiensis formulation with this species . We then assessed the ability of a single enteric bacterium from L. dispar, Enterobacter sp. NAB3, to restore B. thuringiensis-induced killing in those species in which antibiotics reduced mortality. Additionally, we characterized the enteric bacteria associated with larvae of each species and determined the effects of our antibiotic treatments on these communities. Phylogenetic analysis of 16S rRNA gene sequences obtained from clone libraries from the midguts of V. cardui, M. sexta, P. rapae, and P. gossypiella larvae indicated relatively narrow taxonomic diversity of gut bacteria (Table 1). Collectively, all 16S rRNA gene sequences affiliated with either Gram-positive Firmicutes, representing only two species (Lactococcus lactis and Enterococcus casseliflavus) or Gram-negative bacteria within the γ-Proteobacteria subphylum. Amongst the γ-Proteobacteria, all 16S rRNA gene sequences affiliated with the family Enterobacteriaceae except for one, which was affiliated with Pseudomonas putida (Pseudomonadaceae). In addition, the compositions of the gut communities of these Lepidoptera were relatively simple, generally consisting of two bacterial phylotypes, one of which was an Enterobacteriaceae, except in the case of P. gossypiella, which was singularly associated with the Gram-positive bacterium E. casseliflavus. No gut bacteria were identified in H. virescens guts either by culturing or direct 16S rRNA gene analysis. Rearing larvae on antibiotics reduced gut bacteria to below detectable levels in all five Lepidoptera species in which they were previously detectable (Table 1). Enteric bacteria in larvae of five lepidopteran species identified by 16S rRNA gene sequence analysis. 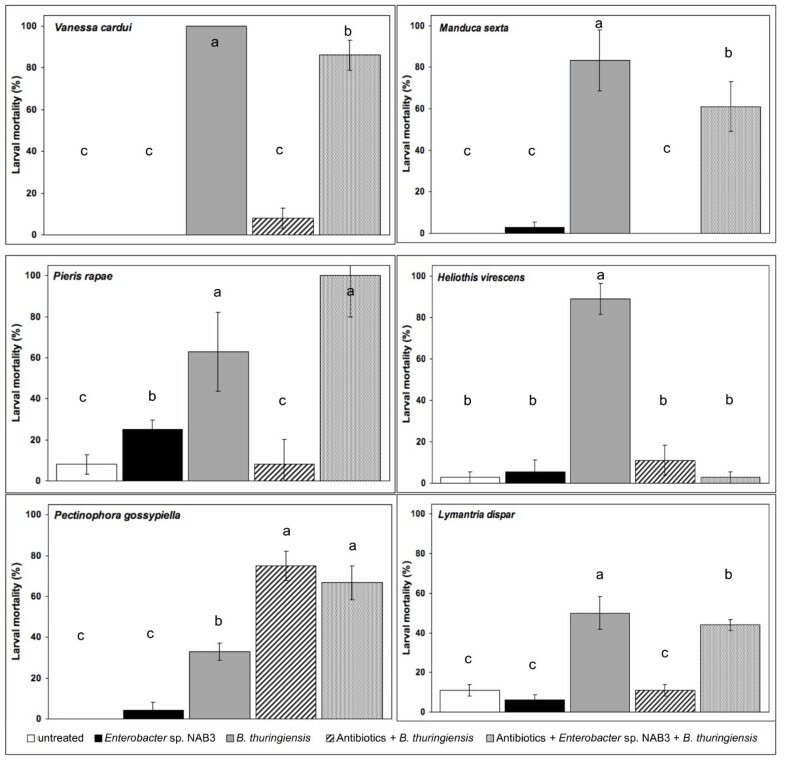 Administration of B. thuringiensis without antibiotics was lethal to all six species, and antibiotics significantly reduced mortality in five of them (M. sexta, V. cardui, P. rapae, L. dispar and H. virescens) (Figure 1). Mean larval mortality of V. cardui, M. sexta, P. rapae, and H. virsescens reared without antibiotics and fed B. thuringiensis cells, spores, and toxin (DiPel) ranged from 63 to 100%. The same concentration of B. thuringiensis caused only 0 to 10% mortality in V. cardui, M. sexta, P. rapae, and H. virsescens when larvae were reared on diet amended with antibiotics. Similarly, mean mortality of L. dispar fed B. thuringiensis Cry1Ac toxin (MVPII) at 10 μg/ml of diet was reduced from 50% without antibiotics to 11% with antibiotics. P. gossypiella responded quite differently. Rearing on antibiotics significantly increased P. gossypiella mortality from 33% to 75% when fed 10 μg/ml of B. thuringiensis Cry1Ac toxin (MVPII). Effect of antibiotics and Enterobacter sp. NAB3 on susceptibility of six Lepidoptera species to Bacillus thuringiensis. Mortality for larvae of each species was analyzed by ANOVA. Each bar represents the mean mortality ± SEM of 36 larvae (three replications with 12 larvae each). Means were separated for significance according to Fisher's protected LSD at P < 0.05 (Vc: F = 189.11, df = 4, P < 0.0001; Ms: F = 47.32, df = 4, P < 0.0001; Pr: F = 280.37, df = 4, P < 0.0001; Hv: F = 93.07, df = 4, P < 0.0001; Pg: F = 36.21, df = 4, P < 0.0001; Ld: F = 47.32, df = 4, P < 0.0001). Administration of antibiotics greatly delayed the time required for B. thuringiensis to kill V. cardui, P. rapae, H. virescens, and L. dispar larvae, and could not be calculated in M. sexta because there was no appreciable mortality (Table 2). Antibiotic feeding increased LT50 values in the range of 10-fold in H. virescens, 15-fold in V. cardui and 4-fold for L. dispar as compared with control larvae. P. gossypiella LT50 values were not affected by rearing on antibiotics or B. thuringiensis treatment. Effect of antibiotics on rate of mortality by B. thuringiensis (Bt) and Enterobacter sp. NAB3 (EntB) on six Lepidoptera species. Feeding Enterobacter sp. NAB3, a normal gut bacterium of L. dispar, restored B. thuringiensis killing ability to antibiotic-reared larvae of M. sexta (from 0% to 61%), V. cardui (from 8% to 86%), P. rapae (from 8% to 100%) and L. dispar (from 11% to 44%) (Figure 1). Mortality following ingestion of Enterobacter sp. NAB3, by V. cardui, M. sexta, H. virescens, P. gossypiella, and L. dispar that had been reared on antibiotics did not differ significantly from untreated controls. However, larval mortality of antibiotic-treated P. rapae larvae following ingestion of Enterobacter sp. NAB3 was significantly higher than untreated controls (25% vs. 8%). In P. rapae, mortality was highest in larvae reared on antibiotics and fed the combination of Enterobacter sp. NAB3 and B. thuringiensis, though this mortality was statistically equivalent to that of larvae reared without antibiotics and fed B. thuringiensis (Figure 1). In contrast to the effect of Enterobacter sp. NAB3 on V. cardui, M. sexta, P. rapae and L. dispar, the addition of the enteric bacterium Enterobacter sp. NAB3 from L. dispar did not restore B. thuringiensis-induced killing of H. virescens (3% mortality), even though rearing on antibiotics reduced susceptibility to B. thuringiensis (89% vs. 11%). In the case of P. gossypiella, though larval mortality to B. thuringiensis Cry1Ac was higher when larvae were reared on antibiotics, Enterobacter sp. NAB3 did not increase or decrease total mortality from B. thuringiensis toxin. The impact of B. thuringiensis on time to death (LT25 or LT50) of V. cardui, P. rapae and L. dispar did not differ significantly between larvae reared on unamended diet and those fed Enterobacter sp. NAB3 following antibiotic-rearing (Table 2). In the case of M. sexta, total larval mortality was significantly lower and time to death greater in antibiotic-reared larvae fed Enterobacter sp. NAB3 than in larvae fed B. thuringiensis and reared on unamended diet (Figure 1, Table 2). There was no significant effect of antibiotics on the time to death (LT50) induced by Enterobacter sp. NAB3 on P. gossypiella. However, there was a significant effect of Enterobacter sp. NAB3 on P. gossypiella mortality due to B. thuringiensis in the first 12 days of the 21-day assay (Table 2). Feeding Enterobacter sp. NAB3 significantly reduced time to 25% mortality in B. thuringiensis-treated larvae, when they were reared on diet both without antibiotics (7.1 vs. 17.9 days) and amended with antibiotics (6.3 vs.15.5 days). These results indicate that enteric bacteria have important roles in B. thuringiensis-induced killing of Lepidoptera across a range of taxonomy, feeding breadth, and relative susceptibility to B. thuringiensis. This impact of enteric bacteria differs among species. Oral administration of antibiotics reduced populations of gut bacteria of all five species in which they were initially detectable, and likewise reduced larval mortality due to B. thuringiensis of five of the six species tested. Feeding Enterobacter sp. NAB3 to antibiotic-reared larvae restored susceptibility to B. thuringiensis in four of these five species. These four Lepidoptera contained gut bacteria closely related to Enterobacter sp. NAB3, which might serve a similar role in larval susceptibility to B. thuringiensis. The similar results with the cell-free formulation of B. thuringiensis toxin Cry1Ac (MVPII), E. coli producing Cry1Aa, and the formulation of cells, spores, and toxin (DiPel) in L. dispar, that is, the reduction of susceptibility by antibiotics and the restoration of mortality by Enterobacter sp. NAB3, indicate that our previous results were not specific to a particular B. thuringiensis formulation. In addition, this result substantiates our previous evidence [27, 37] that the effect of antibiotics on B. thuringiensis susceptibility is not due to direct effects on the B. thuringiensis bacterium, as killing was reduced with the B. thuringiensis cell-free formulation containing only encapsulated Cry1Ac toxin. The inability of Enterobacter sp. NAB3 to restore B. thuringiensis-induced killing of H. virescens indicates that while antibiotics may alter larval susceptibility to B. thuringiensis, the mechanism by which gut bacteria mediate B. thuringiensis-induced killing requires further elucidation, as do the different responses to gut bacteria in various insect species. We were unable to detect gut bacteria in H. virescens, which deserves further study to determine whether it has an as-yet-undetected gut microbiota. Sampling of additional populations, including field-collected larvae and additional methods to detect microorganisms of non-bacterial origin are needed to assess their role in B. thuringiensis-induced killing. Interestingly, P. gossypiella, the only species in which antibiotic treatment did not reduce, and actually increased, susceptibility to B. thuringiensis, was also the only species that was singularly associated with a Gram-positive bacterium, Enterococcus casseliflavus. This suggests that E. casseliflavus might protect its host from killing by B. thuringiensis. Such a protective role has been proposed for gut bacteria of the tortricid Homona magnanima (Diakonoff) , in which Firmicutes related to E. casseliflavus (Staphylococcus and Streptococcus spp.) reduce B. thuringiensis growth in cadavers. We previously reported that a related bacterium (Enterococcus faecalis) was no longer detectable in the guts of L. dispar larvae reared on antibiotics, but unlike Enterobacter sp. NAB3, this bacterium did not restore larval susceptibility to B. thuringiensis . It is also noteworthy that P. gossypiella is much more closely related to H. magnanima than to the other five species tested in the present study http://www.tolweb.org. The lack of Gram-negative gut bacteria (Proteobacteria), coupled with findings reported by others, suggests that the mechanism of B. thuringiensis-induced killing differs between P. gossypiella and other lepidopteran species [39, 40]. While Enterobacter sp. NAB3 did not increase final mortality of P. gossypiella due to B. thuringiensis, it reduced the time until death, with or without antibiotics. This effect is noteworthy given that larvae were exposed to Enterobacter sp. NAB3 for only the first two days of the assay, while they were exposed to B. thuringiensis for the remaining 21 days, because obtaining treatment effects required much longer exposure to B. thuringiensis in P. gossypiella than in the other Lepidoptera used in this study. Though general descriptions have been proposed to categorize host responses to B. thuringiensis , studies have demonstrated that B. thuringiensis susceptibility is influenced by diverse factors including the insect host [12, 37, 41–44], B. thuringiensis strain [45–47], and environmental conditions [48, 49]. Our results demonstrate that in addition to these previously described factors, larval enteric bacteria affect susceptibility to B. thuringiensis, and the extent of this impact varies across lepidopteran species. These factors are not mutually exclusive and in some cases may interact, as, for example, host diet can alter the composition of enteric bacteria [50, 51]. From a pest management perspective, the ability of a non-specific enteric bacterium from L. dispar to restore B. thuringiensis-induced mortality of other lepidopteran species may provide opportunities for increasing susceptibility or preventing resistance. Moreover, this contribution of enteric bacteria to host mortality suggests that toxin feeding causes a transition of otherwise benign bacteria into opportunistic pathogens in some, but not all hosts. These associations between B. thuringiensis toxin and the gut microbiota of Lepidoptera may provide a useful model with which to identify the factors involved in the induction of adverse effects by normally beneficial or benign bacteria. We tested the role of gut bacteria in larval susceptibility to B. thuringiensis among six species of Lepidoptera representing six families. Gut bacteria are required for B. thuringiensis-induced mortality of four of these, Manduca sexta, Pieris rapae, Vanessa cardui, and Lymantria dispar. This work also demonstrates that gut bacteria are not required for B. thuringiensis-induced killing of all Lepidoptera. A reduction of gut bacteria increased P. gossypiella susceptibility to B. thuringiensis, and antibiotic treatment reduced B. thuringiensis-induced mortality of Heliothis virescens larvae, even though no bacteria tested restored killing. H. virescens presents an intriguing model in which bacteria may play a role, but in a more complex manner than in the other host species. The six insect species were selected primarily for their representation of a range of families across Lepidoptera. Additionally, these species represent a range of feeding breadths from polyphagous to monophagous and are exposed to a broad array of phytochemicals, factors that are known to influence B. thuringiensis susceptibility. They are also economically and ecologically important as either agricultural pests or valued biodiversity indicators. Eggs of M. sexta, V. cardui, and P. rapae were obtained from Carolina Biological Sciences (Burlington, NC, USA). Eggs of H. virescens strain YDK were provided from laboratory colonies of F. Gould (North Carolina State University, Raleigh, NC, USA) or purchased from Benzon Research (Carlisle, PA). P. gossypiella strain AF28 was provided by B. Tabashnik (University of Arizona, Tuscon, AZ, USA). Eggs of L. dispar were obtained from culture NJSS at USDA-APHIS (Cape Cod, MA). All eggs were surface sterilized with a solution of Tween-80 (polyoxyethylene sorbitan monooleate), bleach, and distilled water as described previously . Larvae of all species were reared in 15 mm Petri dishes on sterilized artificial diet (USDA, Hamden Formula: M. sexta, V. cardui, P. rapae, H. virescens; amended USDA, PBW formula: P. gossypiella) or sterilized artificial diet amended with antibiotics (500 mg/l of diet each penicillin, gentamicin, rifampicin, streptomycin). Larvae were reared in an environmental chamber with a 16:8 (L:D) photoperiod at 25°C. The B. thuringiensis used in assays with M. sexta, V. cardui, P. rapae, and H. virescens was a commercial formulation of B. thuringiensis subsp. kurstaki (DiPel® TP, Valent Biosciences, Libertyville, IL, USA), consisting of cells, toxins (Cry1Aa, Cry1Ab, Cry1Ac, and Cry2A), and spores. Assays conducted with P. gossypiella and L. dispar used the MVP ™II formulation of B. thuringiensis toxin (Cry1Ac encapsulated in Pseudomonas fluorescens, Dow AgroSciences, San Diego, CA USA). Enterobacter sp. NAB3 was originally isolated from the midguts of gypsy moth larva feeding on sterile artificial diet . For feeding assays, Enterobacter sp. NAB3 was cultured by shaking overnight in half-strength tryptic soy broth at 28°C. The overnight culture was washed once and resuspended in 1× phosphate-buffered saline (PBS) pH 8.0 prior to use in assays. Assays for M. sexta, V. cardui, P. rapae, and H. virescens were performed as previously described for L. dispar . All treatments were applied to sterile artificial diet without antibiotics. Assays were performed with third-instar larvae of M. sexta, V. cardui, and H. virescens. In the case of P. rapae, assays were performed using fourth-instar larvae. A concentration of 25IU, or for H. virescens 100IU, was surface applied in a volume of 1 μl to a standard diet disk (3 mm diameter, 1 mm height) and fed to the larvae on two consecutive days. In the case of P. gossypiella, a standard protocol  using Cry1Ac diet incorporation with the diagnostic concentration of 10 μg/ml of diet was employed. P. gossypiella larvae were provided diet with B. thuringiensis Cry1Ac for the duration of the assay. To provide comparison with previous results, the MVP™II formulation was also tested with L. dispar at 10 μg/ml of diet with the surface application method described above. For establishment of Enterobacter sp. NAB3, larvae reared on antibiotics were fed 1 μl of a washed overnight culture (approximately 106 cells) for two days. For P. gossypiella, Enterobacter sp. NAB3 was surface applied to diet containing B. thuringiensis Cry1Ac for two days, after which larvae were transferred to fresh diet containing B. thuringiensis Cry1Ac. Mortality was recorded every 24 hours for 7 days. In the case of P. gossypiella, mortality recordings were extended to 21 days according to established protocols . Larvae were surface sterilized for 5s in 95% ethanol prior to dissection. The crop and midgut of 10 larvae of each species were pooled and total microbial DNA was extracted as described previously . Bacterial 16S rRNA genes were amplified by PCR from total DNA using primers 27F-HT and 1492R-HT . Clone libraries were constructed with the pGEM-T Vector system (Promega, Madison, WI) and electrocompetent E. coli JM109 cells. Purified plasmid DNA was amplified using the plasmid primers M13F and M13R and sequenced with 27F-HT. All 16S rRNA gene sequences (~700 bp) were compiled using the SeqMan program from the DNAStar software package (DNASTAR, Inc., Madison, WI) and compared with available databases with BLAST to determine phylogenetic affiliations. Mean larval mortality and standard error were determined from three replications of 12 larvae each using PROC MEANS . Means were separated using Fisher's LSD at P = 0.05. The effect of Enterobacter sp. NAB3 on time to death of B. thuringiensis treated larvae was analyzed using PROC PROBIT . Significant differences in LT25 and LT50 values between treatments were determined based on probit values with non-overlapping 95% Fiducial Limits . We thank John Tanner (USDA-APHIS), Fred Gould (North Carolina State University), and Bruce Tabashnik (University of Arizona) for providing eggs of L. dispar, H. virescens, and P. gossypiella, respectively. MDM was funded by Howard Hughes Medical Institute through the Summer Symbiosis Program. This work was supported by Hatch grant (#5240) from the University of Wisconsin-Madison, College of Agricultural and Life Sciences. NAB, MDM, and JHo reared test larvae and performed larval bioassays. NAB, MDM, and CJR carried out the molecular analysis of gut bacteria. NAB performed the statistical analysis of the data. NAB, JHa, and KFR conceived of and designed the study and MDM participated in its design. NAB, JHa and KFR analyzed the data and wrote the manuscript. All authors read and approved the final manuscript.